Die Hard Trilogy is a video game based on the first three installments of the Die Hard series of action movies. Die Hard Trilogy features three games in one, each based on a movie installment and featuring a different genre and game play style respectively. The game was well received and would eventually become a Sony Greatest Hits game. Die Hard Trilogy also inspired a sequel entitled Die Hard Trilogy 2: Viva Las Vegas. The sequel retained the three different playing styles, but featured a spin-off storyline that was not connected to the movie series. Die Hard is a third-person shooter. The player battles terrorists and rescues hostages in Nakatomi Plaza, the setting of the film. Die Hard 2: Die Harder is presented as a rail shooter, where the player must stop terrorists who have taken over Dulles Airport. Players control the crosshair with a gamepad, light gun, or, on PC, a mouse. 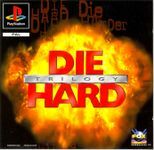 Die Hard Trilogy was one of the few light gun games available for the PlayStation that was not compatible with Namco's GunCon/G-Con 45 controller or GunCon 2. However, it was compatible with Sega's Stunner light gun for the Saturn version. In Die Hard with a Vengeance, the player drives a taxi (among other vehicles) on the streets of New York City and is tasked with finding and defusing bombs before they can go off. Source: Wikipedia, Die Hard Trilogy , available under the CC-BY-SA License.